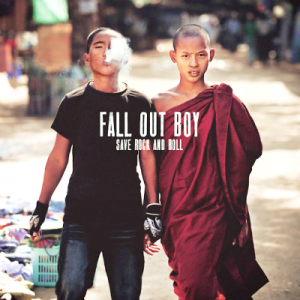 Fall Out Boy – Save Rock And Roll | NoCoda. What It Sounds Like: Mega pop-punk stars return with a disc that seeks to capitalize on every current trend imaginable. This main problem with Save Rock And Roll is the fact that it could have been made by…anybody. There’s nothing Fall Out Boy about it. It’s just produced music, and nothing else. It’s the sound of a band ready to sell some records and sell a lot of them, irregardless of intent, soul-intact or not. I’m all about progression. I understand the temptation for us as fans to want a follow-up that sounds as close as possible to that last record from a band that we adore so much. But without forward motion, anyone is going to get stuck in a rut. The issue here is that Fall Out Boy haven’t made part of this progression natural – it’s all here to cash in. What in the name of all that is good is right is Big Sean doing here? Well, it’s simple. He’s here to add the rap/R&B flavor to a stadium sized power ballad anthem called The Mighty Fall. How about a good beat that you can really dance to for Miss Missing You? What about the Bruno Mars fans? Don’t worry, there’s Young Volcanoes. Yeah, that’s great Courtney. Thanks for your contribution. Her verses are half shouted and sound so out of place, it’s almost laughable. Who is this person who hijacked this song? The record ends with the lamest-of-the-lame title track, featuring, of all people Elton John! What in the world is he doing here? It all just sounds so forced, it’s almost beyond words. By far and wide, the best four tracks here are the first four – but heaven help us – even those aren’t that good. Singles of The Phoenix (the 80s glam jam which features Patrick’s cringe-worthy delivery of lines like I’m gonna change you like a remix / Then I’ll raise you like a phoenix) and My Songs Know What You Did In The Dark (Light Em Up) reach to the end of the galaxy to try and be relevant, the latter actually being remixed by 2 Chainz for a live performance. What is this? What IS this?? I understand that the title of Save Rock And Roll is satirical, but holy cow – this record isn’t even worthy of satire. I kind of enjoy Where Did The Party Go, for the fact that I can bring myself down to the level of enjoying the dance-y beat of it, and I actually do really enjoy Alone Together, it being the closest to the pop-punk sound that Fall Out Boy are know for, and what they do well. All this stuff on Save Rock And Roll is not done well. It’s so calculated and pale that you can see right through it. The music is boring, Patrick’s lyrics are at the low point of his career, and the overall attitude leaves a bad taste in your mouth. People may love to hate this band, but I’ve always been a fan. Take This To Your Grave? Wonderful. From Under The Cork Tree? Hits galore. This is a middle finger to all of us.